Combine meat, Worcestershire sauce, salt and pepper. Shape into 8 thin patties. 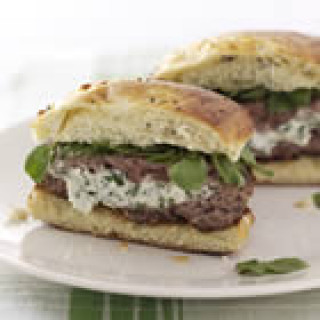 Place cream cheese disks on 4 patties; cover with remaining patties. Press edges together to seal. Heat Black Knight barbecue and brush grill with oil. Add patties; cook about 5-6 min. on each side or until done (160 degrees F). Serve in rolls topped with watercress.